This year witnesses the return of the pop-up Crafts District, a space dedicated to celebrating the social, performative, and critical discourse of crafts and making. 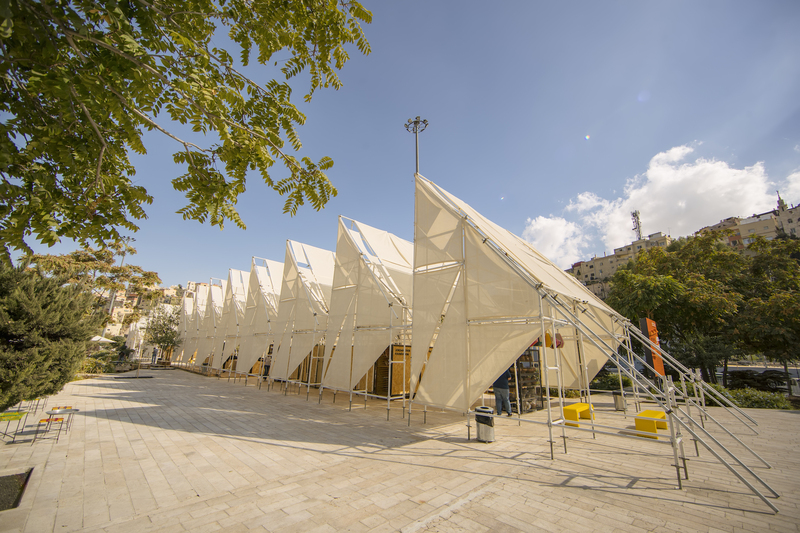 Taking place in an open-air structure designed by architect Dina Haddadin, and at the Al Hussein Cultural Center, this year's Crafts District offers a multi-sensory experience in local culture and traditions in making and preservation. Weave through a series of demonstration booths, pop-up shops, design installations, cultural activities, food, and a selection of craft artisans working with a variety of ingredients materials. Advocating for the return of the handmade, ‘The Craft of Making’ series, curated by Shermine Sawalha, brings audiences closer to the heart of crafts in a learning experience that blends tangible and intangible heritage, design, and technique, highlighting the dying crafts and stories. The Crafts District also extends to the craft of food, with a focus on the art of preservation in local culture, through an interactive experience entitled ‘Mouneh’. Shaped in a manner that resembles the "seil", or stream, of Amman that was buried under the Ras El Ain area of the city in the mid-seventies, "The Stream" is a 100m linear structure is made up of fourteen modular units. Within its 7m high interior void is a temporary pop-up crafts market, curated food program, and design installations built in the form of a social space in the heart of the city. Using a temporary system of scaffolding, the installation creates new geometries and shapes that sway and break around the surrounding environment, allowing nature to spill in. The structure provides a semi-controlled shelter by using lightweight fabric stretched on its skeleton, creating forms reminiscent of origami, in turn creating plays of light and shadow, solid and void. The shops are made of re-appropriated steel bread cages, formerly used as cooling trays in bakeries. This installation was commissioned by Amman Design Week, and done with the assistance of designers Khalid Ali, Norma Kopty, and implemented by RAW (Mohammad Huneiti), and Rana Zeidan. Dina Haddadin is a multidisciplinary architect and a growing self-taught visual artist, living and working in Jordan. Dina's artistic practice is deeply influenced by her architectural work and her examination of cities and places. Her multi-layered work portrays the struggle over the right to the city, and the right to be different in a landscape of transient urbanization. Through drawings, paintings, photography, sculpture and installation, she studies places in transition, changing geographies, belonging and resistance, and imagined places. Haddadin received her B.A. in Architecture in 2006 and is practicing at Symbiosis Designs Ltd. In 2008, she attended courses at the School of Visual Arts in New York City, and participated in a number of local and international exhibitions, Biennales and residencies since.